I've been in the market for a pair of slippers for a while now. I want something that will keep my feet warm while protecting them from the floor. I looked into various bells, whistles, and advanced features. There are slippers with soles that can go outside, for instance, but my feeling is that once a pair of slippers has gone outside, they become shoes. Then they are banished from touching the couch. Another option is slippers filled with goose down. But I'm afraid then I'll just end up with hot feet, which is gross and unpleasant. Ditto for shearling slippers. I also looked into memory foam footbeds. The problem there is that most of them look like the slippers I gave my grandma for Christmas in 1993. 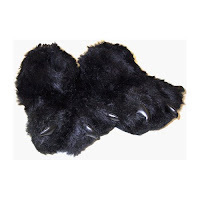 I think we all know what's left: bear paw slippers. I love them because they will be warm and soft and machine washable. They will allow me to stomp around the house and growl. They will make me seem cool when I go to the door in my pajamas. And they wil make me feel more confident around woodland creatures. Bonus points because my husband will hate them (or at least the stomping and the growling).